In the year 2000-2003 I was the scenic artist who did a lot! 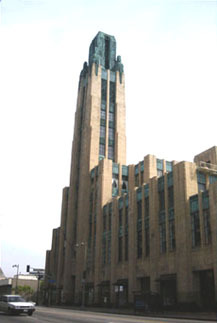 Restoration of the landmark Bullock's Wilshire Building, once a famous department store during Hollywood's Golden Age, was a decorative painter's dream job. I was responsible for color matching over 300 colors. My faux-finish painting included all walls, antique furniture, bronze leafing, faux-marble, copper patina, and mural restorations. The most challenging endeavor was repainting the elaborate crown molding in the Louis 16th Room, and recreating the reverse hand-painted glass ceiling in the Cactus Room Lounge. You may view some of the historic restoration work I achieved for the Bullock's Wilshire Building (now Southwestern Law University), under the stewardship of Seward Construction. Enjoy this Historic trek through my portfolio of images, unique for their artistic perspective. Click on each item below.